No, I don’t do Yoga. I’m a wimp. I admire those dedicated souls who commune with their bodies with this form of exercise. I’m still working on my Silhouette Sky series. The last few I’ve added the human figure. My thoughts were on balance when doing this piece. I’m a lover of balance. Life is all about balance. Fortune and fate, justice and power, debit and credit, mental and emotional, proportional, equilibrium, harmony…. these thoughts all come to mind when thinking about keeping balance in the matters of life. 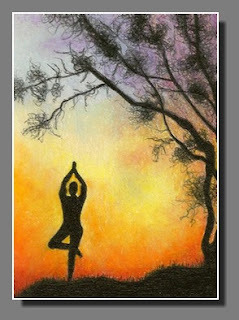 As artists, we use balance in our designs and paintings to bring about harmonious compositions. Ah, to compose our lives the same way…. A silhouette sky series – very creative! Lovely colours in this one. I too am a lover of balance. I am constantly assessing my life to make sure that I keep coming back to my centre. I enjoyed reading your thoughts on this. Thank you, Teresa and Andrew for stopping by and reading. Yes, balance is indeed a constant goal. It would so wonderful if it were all as easy as a click of the fingers, wouldn’t it….. I do yoga but not so long. But I like it. nice colours.